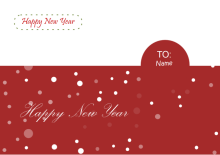 Create new year cards with free templates and examples. Drawing new year cards has never been easier. 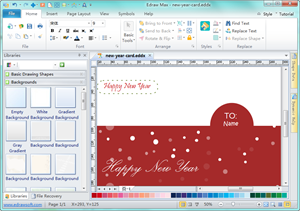 Our new year card software offers easy tools for both designers and novice users to DIY new year card. This diagram platform excels in visualization. You can design professional-looking new year cards though you are not a designer. Have fun to make your personalized new year car and make the new year a blast of fun. A simple yet nice New Year card. You can also insert your families' photos to make it vivid and touching. Click on the picture to download it. View large versions of New Year Card examples. Learn how to DIY New Year cards.